Sweeten your relationships by sending this Magical Love Delight Gift Set to your close ones who deserve your love. This Gift Set is comes along with Imported Silk/Art. 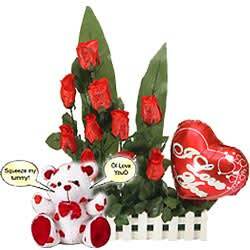 10 Red Roses, a Heart Shaped I Live You Mylar Balloon and a I Love You Singing Teddy Bear. You can wash the Flowers.